View from Behind the Ether Screen. One day it struck me—at 2:00 am in the morning in the midst of another grueling 24-hour shift. I had just finished interviewing a nice lady with an appendix about to burst—we’ll call her Linda. I had done my best not to yawn as I went through the routine questions that an anesthesiologist is obliged to ask. She appeared nervous, which soon gave way to tears. I did my best to comfort her, took her hand, told her I would take good care of her. That I would watch over her carefully in the operating room and see her through surgery. And be there when she woke up in the recovery room. She appeared to calm down a bit. I wrapped up my pre-op assessment and asked her to sign the anesthesia consent form, while assuring her the risks would be minimal. She raised her eyebrows at this and the fearful look returned. I wondered: What the hell does minimal mean when you’re talking about life and death? More tears. She told me of her two young daughters at home that desperately needed a mommy. I felt my own throat tighten. I quickly buried my emotions, tried not to think about my wife and three sons, and focused on the task at hand as we wheeled her litter back down the hall to the OR. After Linda, sans rotten appendix, was safely tucked in the recovery room, operation a success, anesthetic uncomplicated, I lay down in the call room to try to catch a couple of z’s before the beeper would summon me to the next emergency. My mind wandered as I lay there. Rarely, I thought, does a person willingly surrender control of their mind and body to a virtual stranger. Yet, this is exactly what happens when the person is a patient being wheeled in for surgery and the stranger is their anesthesiologist, whom they have just met minutes beforehand. Talk about an extraordinary amount of trust. This degree of trust made a distinct impression on me that night, some twenty years ago. Now I know that this is a crime writers’ blog, not a medical one—and I promise there’s a tie-in here somewhere. Later that same night, my twisted brain (probably amped up on too much caffeine) came around to this: What if the trust Linda had exhibited earlier was ill-conceived and her doctor was actually bad? Not just incompetent or sleepy, but downright evil. Being an avid reader of thrillers, I thought this chilling concept would make for a good story. Too bad I wasn’t a writer. (Disclaimer time: I don’t want to scare people here. All the docs I have known in my 30 years of medical practice are highly competent professional people, who would never purposely hurt anyone.) 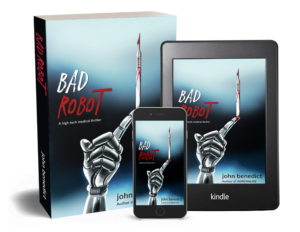 But I still couldn’t shake the evil concept; it kept gnawing at me until eventually I had to put it down on paper—lack of writing experience be damned. So Adrenaline was birthed, my first medical thriller novel that explores this issue of absolute trust implicit in the anesthesiologist-patient relationship—specifically, what happens when that trust is abused and replaced by fear. 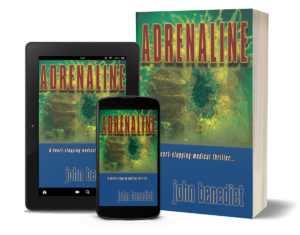 Adrenaline was finally published twelve years after my encounter with Linda. One final note about Adrenaline: As well as telling a scary tale of murder in the OR, I also wanted to tell the story from the anesthesiologist’s perspective, something I had never seen done. 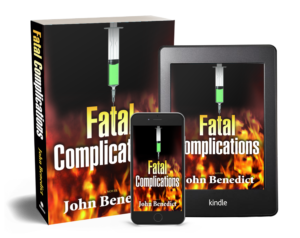 I wanted to give readers a taste of what really goes on in the operating room, the human drama inherent in this high-stress, high stakes environment where lives are saved and sometimes regrettably lost. Finally, I wanted to try to describe what it’s like to hold someone’s life in your hands, while providing an illuminating glimpse into the fascinating, but poorly understood realm of anesthesia. OK, if you made it this far, I’m impressed! If you’re dozing off, well don’t be surprised. It’s what I do—remember? What follows next is the genesis behind my second medical thriller, The Edge of Death (the sequel to Adrenaline). As a physician, I have always been intrigued with the definition of life and death, the boundaries that exist between them and the multitude of end-of-life scenarios that we all will face at some point. As an anesthesiologist, I feel I am even more intimately familiar with the fine line between life and death. In fact, each time I put one of my patients to sleep, I purposely take them down to The Edge of Death and then bring them back. This is what we do, for this is the very essence of anesthesia. Think about it. When you’re anesthetized, you’re not just “asleep”, enjoying a peaceful repose like you would in your own bed at night. Far from it. You’re deeply unconscious to the point that someone can slice you open with a knife and you don’t feel it or wake up. Someone is usually breathing for you. You’re not that far from being dead. Now that’s a deep sleep. (Disclaimer #2: Again, I’m not trying to scare anyone here in real life. In the hands of a competent anesthesiologist, this type of sleep, routinely induced tens of thousands of times a day across the US, is very, very safe. People typically face a larger risk driving to the hospital than in the OR.) So it’s no surprise really that several years ago while journal reading, one particular article jumped out at me. The researchers, who were exploring cutting edge techniques in resuscitation medicine, noted that in patients who were newly declared dead, they could still demonstrate under the microscope, the presence of viable cells in various organs—sometimes even hours after death! So, cardiac muscle cells were seen to be alive, hours after death. This was a staggering revelation to me, especially since it represented real science—not the realm of fiction. One would think that with advancing technology and the increasing sophistication of our monitors, etc., that the definition of death would have become more and more precise in the modern era. One would be wrong. In fact, the situation is less clear-cut than ever. Fifty years ago, it was simple. When your heart stopped beating, you were pronounced dead. Period. Nowadays, it’s not so simple. Witness the poor folks kept alive on breathing machines and drug infusions in the ICU. Witness the legal battles surrounding these patients as family members, doctors and lawyers wrangle over if they are really dead. They have no brain wave activity (even the definition of brain wave ‘activity’ is controversial and constantly changing with newer electronic monitors), so they’re pronounced brain dead and life saving support may now be legally withdrawn. The heart’s still beating just fine and the liver and kidneys continue to function normally. In fact, these organs are in such fine shape that they are routinely transplanted from the “dead” patient into a living patient. One wonders through all of this, where does the soul reside, assuming you believe in such a thing? In the brain? Or perhaps the heart? Or one of any number of other organs? Or is it spread out over the entire body? Does anyone actually know? So, in light of this journal article and in the face of advancing technology, I wondered: If the definition of death is so muddled, when does the soul know it’s time to flee the body? What is the specific triggering mechanism? Brain death? Heart death? Liver death, etc? Taking it one step further, what happens to the body if it is resuscitated after the soul has left? The Edge of Death flowed directly from these questions. The story explores what happens when the normal end-of life-scenario intersects with advances in state-of-the-art, hi-tech medical resuscitation science. In the story, Nick Chandler, a patient with a fatal viral myocarditis, hovering on the edge of death, is miraculously revived in Dr. Mueller’s experimental lab. However, in addition to losing his soul, Chandler undergoes a chilling metamorphosis into a man of superhuman strength, supernatural prescience and absolutely no remorse. 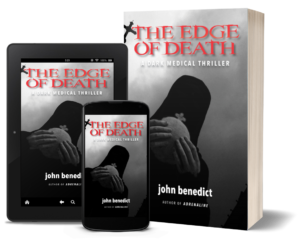 The Edge of Death represents a departure from straight medical thriller fiction; it is a darker, spookier tale with supernatural overtones that is nevertheless told from an authentic medical perspective—something new and unique. It stretches the genre a bit, but hopefully, readers will find it as compelling as I found it to write. Just don’t read either of these stories the night before surgery! ‹ BOOKS IN PRINT NOW EXCEEDS 100,000! !